Being that I write a friendship blog, it shouldn’t surprise you that I am usually keen to explore new friendships. The newest friendship that is blossoming is just as exciting as any other. I am a little bit fascinated and very much in awe of this new person who seems so different, yet so the same as myself at the same time! It is always thrilling to get to know someone on a deeper level and challenging the misconceptions and conclusions you didn’t consciously know you’d drawn about them. That brings me to my next point in exploring this new friendship. It is highlighting to me all the ways my personality and friendship style are either different with her than with other people, or just different in general than what I believed myself to be. I love exploring the contradictions in people, always thinking I myself was too boring to have any. I don’t know what it is about this person in particular, but she has a way of making me feel much more dominant and extroverted than I would comfortably class myself as being. I pride myself on being a good listener, with attention to detail and follow through on important issues. Not as good as this person though! Not even close! She blows me out of the water! Lol I feel I always ask questions (which I am learning can come across as intrusive over caring) and generally submit to the other person’s whims. 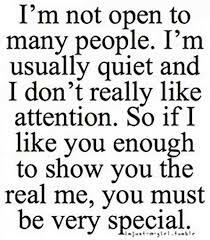 Basically I feel like I am a quiet person, shy, who prefers to keep the limelight on other people as a general rule. Looking at our interactions honestly, I would be VERY surprised if my newest friend saw me in the same light I see myself!! I notice that I have chosen the venue for the catch up’s, and without meaning to be overbearing, both times I spoke for this poor woman when we ordered at the counter. After the last catch up, I realised I had walked away having shared much of myself, but having learned very little about her. There were things I had wanted to ask her, but somehow I didn’t find the time between all my conversations about me!!! This new friend is very softly spoken, and although I have never considered myself to be loud or confident, somehow I feel like such an extrovert around her. This does not sit well with me. In part because I want to be the friend I pride myself on being, and in part because it is uncomfortable for me to see myself in this way. I want to learn more about my new friend, and I want her to feel comfortable in opening up and sharing herself with me, however I am going to have to learn in this instance how to give her the space to exist in our friendship. I have discussed this with her and said that at our next catch up, at a venue of her choosing, where I will not order for her, because she has a voice, I want to learn more about herself. The venue she chose surprised me just as much as her admitting she likes loud music in her car. I love that there is so much to learn about her and challenging all the conclusions I have jumped to in an effort to categorise her mentally, however inaccurately. This intrigues me, and I want to reciprocate the attentive friendship she has offered. I really hope I can. I also really hope I can explore and challenge my misconceptions of myself, or that it is in some way bad to be extroverted, or dominant. As long as I can still allow my friend to share herself, to feel heard and valued and validated, I look forward to accepting this newer side of my personality, that I hope exists through much work towards self love, esteem and acceptance, leading to a quiet confidence that I did not previously possess. I hope to enjoy this side of myself and stop being so uncomfortable with my own voice. This new person definitely seems to increase my energy. I only hope it is not at the expense of draining her own... Something to be mindful of! I’d really like to thank this new friend, for coming into my life and embracing all that I am, even when I don’t quite know what I am myself. For challenging my perceptions of herself, of myself and of friendships. For evoking a side of me I didn't really know existed. And to thank her for her patience and trusting in my positive intention although I am sure I have seemed overwhelming, overbearing, and intrusive. I'm sorry about that. I guess I am finding my voice. Let’s both make an effort to ensure it isn’t at the expense of your own?! I will try harder to make space for you to share with me, without actually asking and trust that you will share with me all that you want me to know. You are teaching me that friendships are as unique as the individuals in them. I have much to learn from you, and I will do my best to mirror you in order to allow our friendship to reach its full potential. Friendships are important! I do value them!